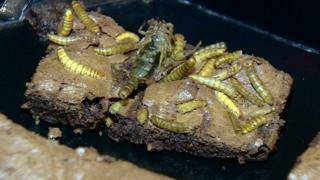 A bakery selling cakes made from insects has opened in Edinburgh, in Scotland. Cyril Barthelme, who opened the Patisserie Maxime bakery, wants to change the way people think about eating bugs. Around two billion people worldwide eat insects as part of their diet, and some scientists say they are better for you than other types of meat. Scorpions, mealworms and crickets are just some of the ingredients added to the bakery's special brownies. So what do you think of these creepy-crawly bakes? - would you try them? This chat page is now closed.